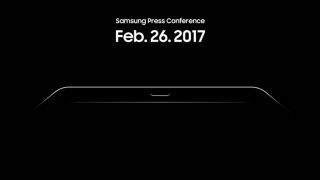 Samsung may not be bringing the much-anticipated Galaxy S8 to MWC 2017, but it looks like the company’s got another big product announcement on the cards for the event – the South Korean electronics giant has sent out invitations for an upcoming press conference on February 26 featuring a teaser image of what looks to be a new tablet. The image, which only brings a small portion of the mysterious device into view, shows what appears to be the tablet's bottom section. We can assume that it is indeed a tablet and not a smartphone based on the size of the home button in relation to the device’s corners, which can also be seen. Though nothing has been confirmed as yet, it’s highly likely that the device in the teaser is the long-awaited Samsung Galaxy Tab S3, which has reportedly been certified by the FCC, according to a new leak. The latest rumours suggest that the new tablet will have an Exynos 7420 octa-core chipset, 4GB of RAM and a fingerprint scanner. Here’s hoping the Galaxy Note 7’s impressive iris scanner also makes an appearance. If Samsung does indeed reveal a new tablet at its MWC 2017 press conference, it will be its first since the Samsung Galaxy Tab S2 was released in September 2015. We'll bring you more information on the device as it unfolds.